Though marble and granite are unrivaled for their beauty, price reasonably, these classic materials warrant careful thought. Also, while marble is a little easier to stain, granite shrugs off most stains. Marble is typical and the preferred choice in most bathrooms. It’s available in slabs form and in standard counter dimensions of 19 and 22 inches deep. . Although easy to clean, marble must be well cared for. Follow the manufacturer’s recommendations for what type of finish to apply to cultured marble to best protect it. 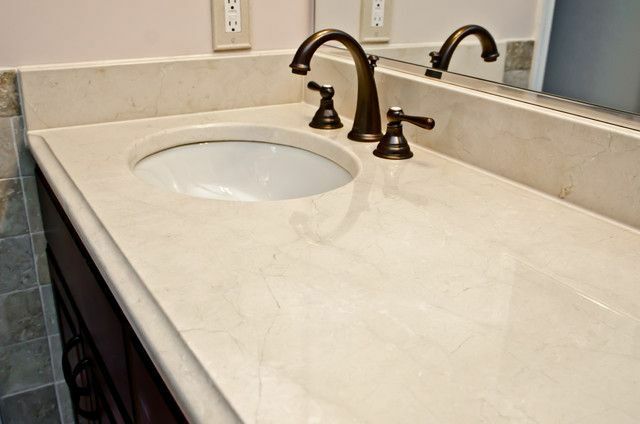 Solid surface countertops offer many of the advantages of stone with no drawbacks. Cast from an acrylic resin that sometimes include crushed stone—particularly quartz—solid-surface material demands little maintenance and is extremely durable. Intense heat and heavy falling objects (which shouldn’t pose much of a threat in bath­rooms) can cause damage, but scratches, abra­sions, and even minor burns (if you leave a curling iron on the vanity top, for example) can be repaired with fine-grade sandpaper. The methods and tools needed for working with this material are similar to those required for woodworking. However, most manufacturers require that a trained professional install their materials. Solid surface material is available in almost any flavor of color or pattern known to man. Quartz is a great choice for bathroom vanities as well.